The extensive salt marshes of He‘eia inland from the fishponds (loko) were not suitable for cultivation, but fringing them to the southward, flanking both sides of He`eia Stream from which they are irrigated, lie the vast terraced lowland flats of this ahupua`a, which were in 1935 still largely planted in commercial taro. The southern portions of these lo`i were irrigated from Kalimukele Stream which turns southward and flows into Kane`ohe; while the small stream named Pu`olena supplements the He`eia on the north. These terraces extend up the main stream to the junction of Ha`iku Stream and `Ioleka`a, flowing from the west and southwest, respectively. A small stream named Kaiwike`e flows into `Ioleka`a from southwestward in the Ko`olau range. Up all these valleys are old lo`i, now abandoned. 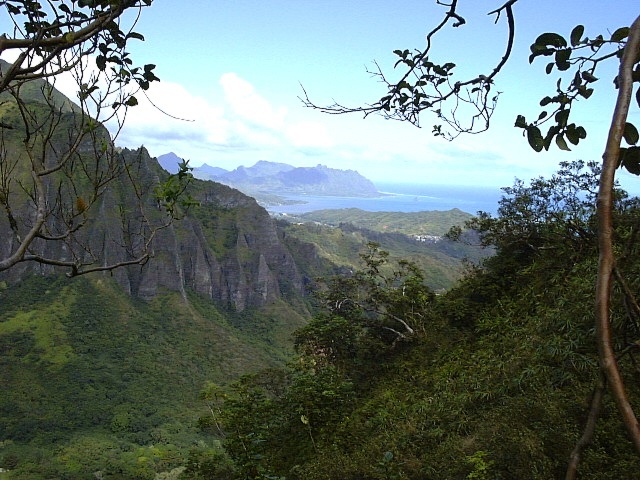 This photo, burrowed from Mike Gawley, shows the upper part of He`eia ahupua`a from the Haiku stairway with the northern end of Kane`ohe Bay and the ahupua`a of Kualoa in the distance.